My scholarship addresses the survivance of Indian nations in the 20th century Pacific Northwest despite federal and local efforts to conquer and assimilate Indian people. Topics on which I have written include the effects of dam building on the Columbia River on Northwest fishing tribes, the struggle for federal recognition among tribes in the Northwest, the role of regional Indigenous women leaders, and the history of representation and misrepresentation of Native people in museums and public history programs. A secondary interest is the history of the 20th century Pacific Northwest more generally. I have written regional history surveys, and about World War II-era conscientious objectors who were housed in Waldport, Oregon, and women authors and activists. I have also written about public history methods for regional and national audiences. Now out! 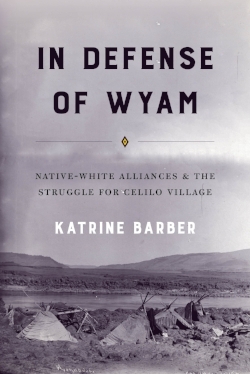 In Defense of Wyam: Native-White Alliances and the Struggle for Celilo Village is available. This book presents a remarkable alliance across the opposed Native and settler-descended groups, chronicling how the lives of two women leaders converged in a shared struggle to protect the Indian homes of Celilo Village. Flora Thompson, member of the Warm Springs Tribe and wife of the Wyam chief, and Martha McKeown, daughter of an affluent white farming family, became lifelong allies as they worked together to protect Oregon’s oldest continuously inhabited site. As a Native woman, Flora wielded significant power within her community yet outside of it was dismissed for her race and her gender. Martha, although privileged due to her settler origins, turned to women’s clubs to expand her political authority beyond the conventional domestic sphere. Flora and Martha’s coordinated efforts offer readers meaningful insight into a time and place where the rhetoric of Native sovereignty, the aims of environmental movements in the American West, and women’s political strategies intersected. University of Arizona Press, Nature’s Northwest: The North Pacific Slope in the Twentieth Century (with William Robbins), Spring 2011. Nature’s Northwest: The North Pacific Slope in the Twentieth Century (co-authored with historian William Robbins) was published by University of Arizona Press in 2011 as part of their Modern American West series. Richard Rajala called the book “a transnational regional history of great thematic reach and coherence” in his review for BC Studies. Historian Max Geier wrote, “They effectively compare triumphalist narratives across borders, depicting a conflictive landscape where people struggle to shape a common culture from their disunited pasts” in a review for H-Net. University of Washington Press, Death of Celilo Falls, November 2005. Published as part of the Emil and Kathleen Sick Lecture-Book series in Western History and Biography. From the press: For thousands of years, Pacific Northwest Indians fished, bartered, socialized, and honored their ancestors at Celilo Falls, part of a nine-mile stretch of the Long Narrows on the Columbia River. Although the Indian community of Celilo Village survives to this day as Oregon's oldest continuously inhabited town, with the construction of The Dalles Dam in 1957, traditional uses of the river were catastrophically interrupted. Most non-Indians celebrated the new generation of hydroelectricity and the easy navigability of the river "highway" created by the dam, but Indians lost a sustaining center to their lives when Celilo Falls was inundated. Death of Celilo Falls is a story of ordinary lives in extraordinary circumstances, as neighboring communities went through tremendous economic, environmental, and cultural change in a brief period. Katrine Barber examines the negotiations and controversies that took place during the planning and construction of the dam and the profound impact the project had on both the Indian community of Celilo Village and the non-Indian town of The Dalles, intertwined with local concerns that affected the entire American West: treaty rights, federal Indian policy, environmental transformation of rivers, and the idea of "progress."